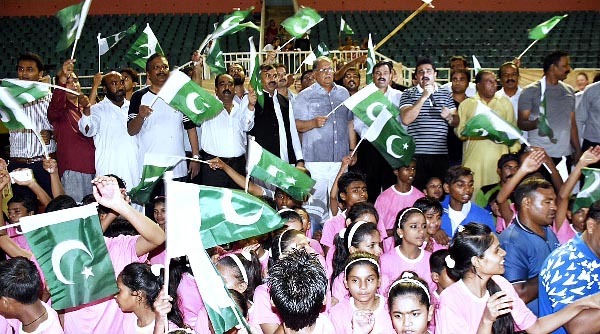 Coordination Mian Riaz Hussain Pirzada on Saturday inaugurated National Minorities Sports Festival here at National Stadium. While speaking on the occasion, the Federal Minister said that incumbent government would leave no stone unturned to promote sports activities in Pakistan by all means. He said minorities in Pakistan always played positive role for the development of the country whether it was field of sports or politics. Moreover, they always showed unity and loyalty toward the prosperity of the country in any challenging situation. Pirzada appreciated tableau presented by the young girls and boys participating in the event. He assured full support of the government to make the festival successful. Earlier, Kamran Michael, Minister for Human Rights warmly welcomed the Inter-provincial Coordination Minster and presented bouquet to Pirzada. He said the main objective of organizing this event was to fulfill vision of the Prime Minister to bring the minorities in national mainstream adding that “ we are Pakistani and Pakistan is from us. Minorities had to prove this by their conduct”, he added. start at the Pakistan Sports Complex from August 7 to August 11. The event is being organized by Ministry of Human Rights (MOHR) in connection with National Minorities Day to be observed on August 11. The National Minorities Day got official recognition in 2009 by the efforts of former Minister of Minorities Affairs Shehbaz Bhatti who was assassinated on March 2, 2011. An official of the Human Rights Ministry told APP that the Minister had directed to form a committee to observe the event and ensure complete facilitation to the players of various participating teams. The games to be contested in the event include football, cricket, basketball, body building, athletics and badminton.